It happened again. Last winter, driving the Audi A8 on a snowy day, a bus unexpectedly came rumbling up a dirt road. Most cars would have fish-tailed like a dog sled in the Iditarod, but the A8 responded to a sudden nudge to the steering by almost magically swerving smoothly to the side, sweeping with a brush of silver onto the shoulder, through deep snow, and back onto the road again. We panicked; the car swerved. With the A6, we were in a parking lot. Checking every mirror, of course – tightening seat belts, glancing around. No problems. Then, a biker appeared out of nowhere and the bleeps from behind started. We shot a glance at the back-up camera and, sure enough, the image of a biker flashed for a brief second. On the A6, not only are there sensors to warn you about an imminent collision, but you hear them from the direction that matters most: where the impact might occur. This auditory warning is downright cool. And get this: You can even control the volume of the chimes. Let’s say you really want to hear a beep when you are backing up at a parking lot, but the sensors near the front seem more obvious. You can raise the rear volume for sensors and lower the front – or side beeps. The A6 offers these luxury features as standard, and it’s what sets the vehicle apart. We made no secret about favoring the A7 and A8 in recent tests compared to other sporty models. 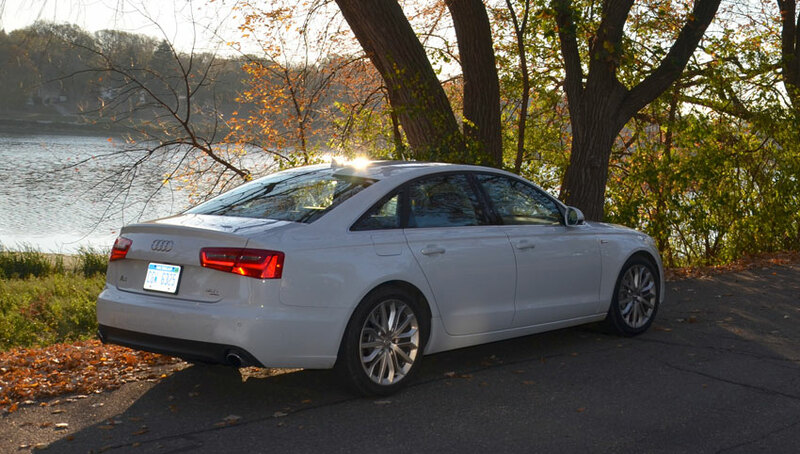 The A8 still lingers on as one of the best drives we’ve had in the luxury sedan segment. The A6 fit just beneath those vehicles as you’d expect from the rather pedantic numbering scheme. What might not seem obvious is that the A6 feels like a luxury boat that is ready to set sail at the marina, only smaller. For styling, there’s the atypical sleek bow shape of an Audi: no frills, just elegant and refined. In many ways, the A6 looks much closer to the A8 in terms of its bland-on-purpose design. No bubble shapes here like you get on an Infiniti, no sharp angles like a Cadillac or Mercedes, no chunky front like a Volvo. Fans of the Audi brand prefer this understated refinement, and the A6 has it more than the A7. This is a sporty drive, although the A6 is no racing sedan, ala the Cadillac CTS-V. That said, the 3.0-liter turbocharged engine, a V6 delivering 310 horsepower with 325 lb-ft. of torque, is spritely if not exactly race track ready. Audi says the 3.0 is supercharged to act like a V8. Well, that may be true, depending on your perspective. The A6 goes 0 to 60 in just 5.3 seconds. You can easily switch into a paddle-shifter mode and there is plenty of raw power, but the horsepower figure doesn’t quite match the competion. The A6 fits well below the CTS-V, the Mercedes-Benz C63 AMG, and other top-end luxury models. The acceleration felt more like driving an Infiniti G37 – smart tuning intended to make a V6 more respectable. 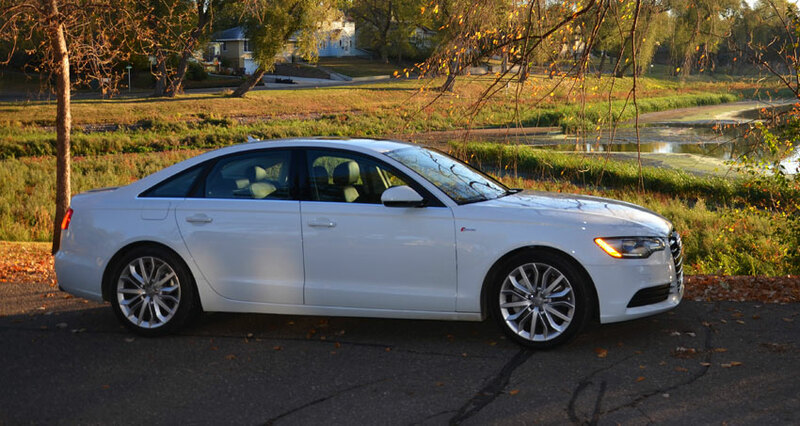 In terms of handling, the A6 is small enough to feel nimble on the road, big enough to stretch out in front and back. Our passengers on a 200-mile drive never complained about the leg room. Frankly, the trunk is almost too big. We stuffed suitcases for four people and had plenty of room leftover. The stereo system is powerful, bass-driven, and quite enveloping, but not nearly as memorable as the A8 and even pales a bit compared to recent favorites like the Jeep Cherokee. 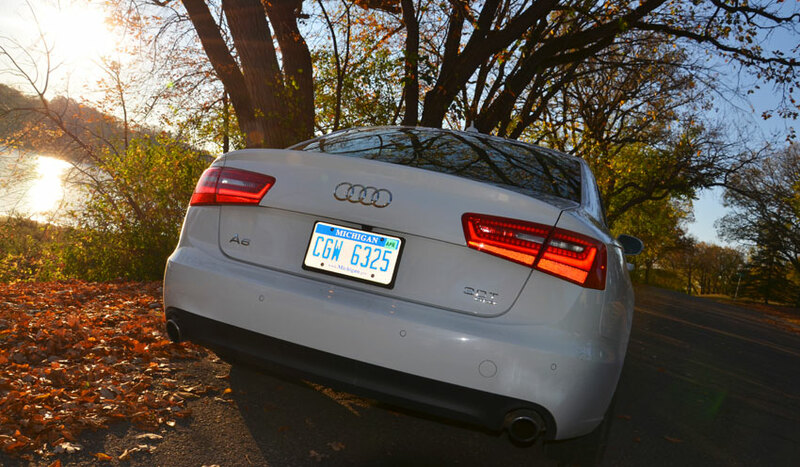 The A6 we tested goes for $49,900 with all-wheel drive and the 3.0-liter engine, but the base package costs $41,700. Audi dropped the V8 this year, so that means the BMW 5-Series we tested in Las Vegas about nine months ago, which felt noticeably faster on the open highway, is a smarter choice if you really need that power. The Mercedes E-Class brand has arguably more tech features. 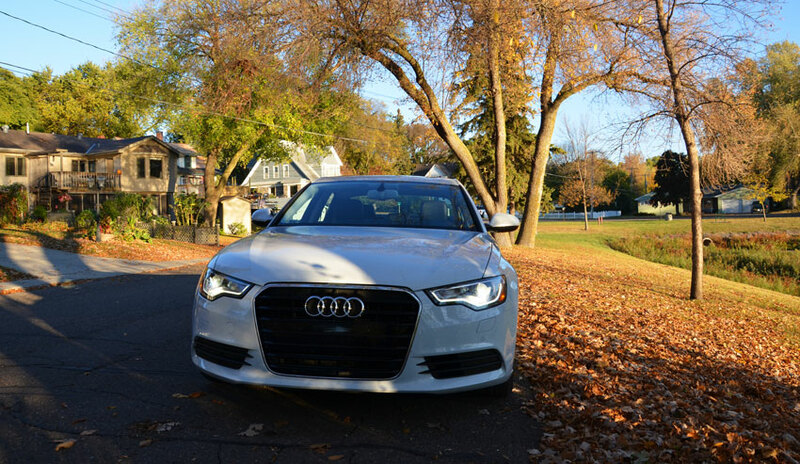 With the A6, there is an innovation package that adds pedestrian detection, more traffic sensors, and adaptive cruise. The Audi faithful know that the A6 is all about practical refinement – the design is understated. The handling and acceleration are not best in class, but they are definitely noteworthy. In our tests, flying through the gears at all speed levels, there’s a humming sound that is distinctly Audi. True this is no A8 – there are no extra features for adaptive suspension that make cornering smoother, and there are no sat speakers near the windshield that rise up from the netherworld when you punch the on button. Yet, there are subtleties to the A6. In the stereo, when you adjust the sub for your radio, you’ll find that you can set a different level for a connected iPod player, and the A6 remembers these settings. Like many Audi cars, you can push a button to fold the side mirrors in. And, there’s a blind spot detection that blinks brighter and is more sensitive to actual passing cars (not roadside fruit stands) than other cars. In the nav system, you can find your waypoint easily, but you can also turn on Google Earth and see 3D representations of buildings and photos from other drivers (using the Panoramio service). You can perform a Google Search for local business, eateries, and the closest gas station. There’s 3G service in the car, and you can create a hotspot for passengers to connect to the Internet. Overall, the A6 is easily one of the best cars we’ve driven this year. It’s not as expensive as the E-Class or the BMW 5-Series, since many models start above $50,000. We’re fans because of the refined styling, the extra tech features, and even the reasonable fuel economy (for a turbocharged V6). We still want to get our hands on a version with the innovation package; as it stands, this sporty sedan has all the right features, at the right price, with the sleek refinement that says luxury without the stuffy demeanor (or price).